You are at:Home»Herbs»Trachyspermum ammi Sprague. Latin name : Trachyspermum ammi Sprague. Description : The seeds possess antifungal, antimicrobial, antiseptic, antispasmodic, aromatic, bitter, carminative, diaphoretic, digestive, diuretic, expectorant, stimulant, stomachic and tonic. They are used in respiratory disorders. It is useful in chest congestion occurring due to accumulated cough. In conditions like whooping cough and asthmatic bronchitis it is used alongside the main line of treatment. The seeds can be taken orally and/or used externally for fomentation of the respiratory area. They have proven their effectiveness in common conditions like rhinitis, sinusitis, pharyngitis, laryngitis, bronchitis, etc. 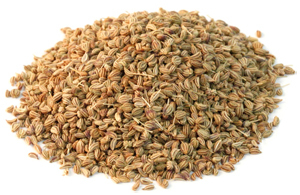 The volatile oil (Thymol) and the seeds are useful in flatulence, indigestion, colic, diarrhoea, cholera, hysteria and spasmodic affections of the bowels and checks chronic discharges such as profuse expectoration in bronchitis. Relieves muscle spasms.